It gives us great pleasure to announce Russell Ricard as the guest on episode 109: Just Keep Showing Up! 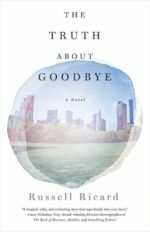 This week Russell Ricard joins us to talk about his new novel The Truth About Goodbye, moving from early script, to novel, and onward to screenplay, and the inspiration for the work. Louisiana Creole, Russell was born in Baton Rouge. At eight years old, he moved to Los Angeles, California. And since 1988, he’s called New York City home. For over three decades, he worked as an actor, singer, and dancer in regional, national tours, and international productions, including appearing on Broadway. He has a BA in Psychology from CUNY/Queens College, and earned his MFA in Creative Writing from The New School. He’s intrigued with the psychosocial aspects of otherness: the quality or fact of being different. Therefore, his writing often includes themes of growing up; aging; family dynamics; and also romantic couplings, including how character’s race, sexual orientation, and gender inform interpersonal relationships. His writing has appeared and/or is forthcoming on thewritelife.com, mrbellersneighborhood.com, and in Newtown Literary. His novel, The Truth About Goodbye, is available from all major book outlets. He currently lives in Forest Hills, NY with his husband, cat, and a lovingly supportive stand up desk named Ruth.